There's been a backlog of stories at HispanicNashville.com, and these are they. I apologize to those whose events were not announced here in advance. Let me know in the comments what announcement you think should have been made on its own. Tennessee State University is hosting its annual Cultural Appreciation Week, starting with this Saturday's International Soccer Tournament and Community Family Day on Saturday, April 7 from 8am-5pm at the Indoor Practice Facility. The Nashville International Cup is inviting 12 teams to participate in the International Soccer Tournament taking place at the University. Teams invited to take part include Kurdistan, Iran, Iraq, Vanderbilt ISSS, Trevecca Bosnia, Lipscomb University Malagasy, Sudan, Bantu, Burundi, Mexico, Asia and Congo. There will also be activities for the family including face-painting, Easter egg hunt and photos with the Easter bunny, food and music. The Nashville Spanish Language Meetup conversation group is still going strong. Their next meeting is next Tuesday, April 10, near the Tennessee Titans football stadium. 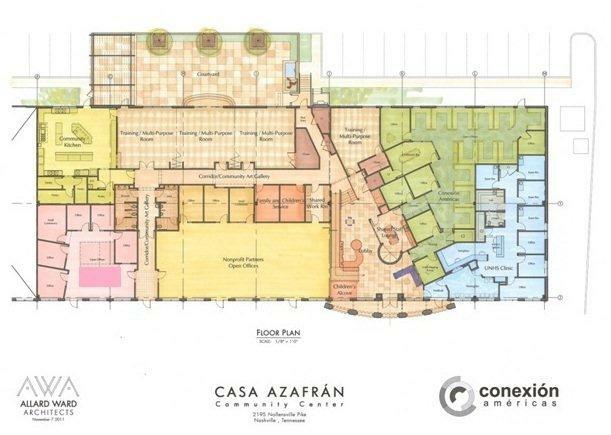 Conexión Américas announced a Groundbreaking Event and Open House at the site of Casa Azafrán Community Center, its future headquarters, to be held at 9:30 a.m. on Saturday, April 21, at 2195 Nolensville Pike (RSVP to cara@conamericas.com). The event will be a festive community gathering, with music and food trucks and special remarks from Nashville Symphony Maestro Giancarlo Guerrero & Shirley Guerrero, Honorary Capital Campaign Co-Chairs. Conexión Américas purchased the 28,800-square-foot building, at 2195 Nolensville Pike, in December and will share the space with other Nashville-area nonprofits and partners with long histories of good works - United Neighborhood Health Services, Family and Children’s Services, YWCA, and Justice for Our Neighbors ("JFON"). Standing at the gateway to Nashville’s most international and socially diverse district, near I-440 and the state fairgrounds, Casa Azafrán will serve all area residents. It will be a place for education, health services, entrepreneurship training, culinary and artistic expression, volunteerism, community building, events. It also is a smart way for nonprofits to share resources, meeting and training spaces and opportunities. Of the $4.7 million estimated cost, 72% will be funded through the support of private donors and institutions. On May 3, Javier Palomarez, President & CEO of the United States Hispanic Chamber of Commerce, will speak at a networking lunch of the Tennessee Latin American Chamber of Commerce. Networking and Registration at 11am; Program and Lunch from 11:30am-1pm. 11:30 a.m. to 1:00 p.m. Location TBA. RSVP by May 1 (TLACC members admitted free and RSVP here; non-members pay $35/person and RSVP here). The City of Winchester, Tennessee will host its eighth annual International Dogwood Festival from May 4-6. Each year we take the Dogwoods to a different Country and feature that Country in our decorations, food, entertainment, etc. Since Cinco de Mayo falls on the Saturday of this year's event, we are featuring Mexico in 2012. The festival runs three days and features live entertainment (FREE to the public) all three days. Festival organizers are still receiving applications for vendors, crafters & street performers. We dedicate an entire street to the Festival Theme each year. Vendors on the theme street are not charged to set-up or sell their wares, if they fit the theme. If you have any interest, please visit our website: winchesterdogwoodfestival.com. We are an award-winning festival and would like to get the word out to the Hispanic members of the Nashville community. Reading Early Modern and Postmodern Hispanic Cultures, Edited by David R. Castillo and Bradley J. Nelson. In February, Diana Holland played grandmother Maria Josefa in the play "The House of Bernarda Alba" by Spaniard playwright Federico Garcia Lorca. This version of the play was in English, a collaboration between Actors Bridge Ensemble and Belmont University. Scarritt-Bennett's Diversity in Dialogue (DID) groups on racism and on immigration are starting up this week. Dialogue Groups are made up of 8-12 diverse individuals. Led by trained facilitators, they provide a forum for people to share their feelings, opinions and thoughts in a non-defensive, non-critical environment. The objective is to help participants understand their own and other's views on racism, diversity and faith to create long-term change. To date, more than 2,500 people have participated in DID, including groups associated with private businesses, government agencies and universities. The U.S. national men's soccer team played three Olympic-qualifying matches in Nashville in March - against Canada, Cuba, and El Salvador. The Americans fell short and failed to qualify for the quadrennial international games due to a last-minute goal in a 3-3 tie to El Salvador. A Cuban player defected in Music City. Officer Gilbert Ramirez of the Nashville Police's El Protector program held a seminar for Hispanic members of the Nashville community about gang prevention, at the South Precinct at 5101 Harding Place. DCS and Youth Service were also present to discuss parents' rights. Over 100 Middle Tennessee clergy attended the premier screening in January of a documentary on faith and immigration and engaged in dialogue with a panel of bishops about the issue. “Gospel Without Borders,” produced by EthicsDaily.com, made its Nashville debut at Loews Vanderbilt Hotel to more than 125 faith leaders. The event was organized by Clergy for Tolerance. Vicente Fox, former president of Mexico, and Bill Richardson, a former governor of New Mexico who has served as U.S. ambassador to the United Nations and as secretary of the U.S. Department of Energy, delivered public lectures at Vanderbilt University in March as part of the university’s annual Impact Symposium. The theme of this year’s lectures was “Rise of the Rest: What is the Future of American Foreign Policy?” The discussion between Fox and Richardson was moderated by Vanderbilt sociologist Katharine Donato. "Latin Heat and other ballets" were performed by the Dance Theatre of Tennessee at Father Ryan High School in March. Glencliff High School held an International Celebration of Cultures in March, with booths from over 30 different countries, a fashion show, international dancing, and international foods. The celebration was sponsored by the United Nations Leadership Organization of Glencliff High School. Attendees brought canned food or non-perishable food items for Second Harvest. Conexión Américas announced that its free tax preparation services through the IRS-sponsored VITA program will prepare approximately 200 tax forms on behalf of Latino families and individuals in Middle Tennessee in 2012. In 2010, Tennessee received $157.4 million in personal income, property and sales tax paid by families whose heads of household are unauthorized immigrants, according to the Institute for Taxation and Economic Policy. According to a 2007 Congressional Budget Office report, 50 to 75 percent of undocumented immigrants pay federal, state and local taxes. An anonymous disciplinary case review officer for Corrections Corporation of America was quoted in the New York Times as saying, "I'm the Supreme Court," in an article about lack of accountability of private prison facilities. The Tennessee Latin American Chamber of Commerce announced its incoming board President, Nelson Remus, President of Remar, Inc. Also announced were incoming Vice President Mayra Zimmer, vice president at AGLA; and board members Jesus Cachaya, Imperial Services; Tracee Carpenter, Fifth Third Bank; Trudy Carson, Metropolitan Nashville Airport Authority; Jessie Garcia Van De Griek, Lipscomb University; Ann Gillespie, ProLingua, Inc.; Marcela Gómez, Hispanic Marketing Group; Shane Merrill-Facio, SunTrust Bank; Raul Miranda, MetLife Southern Financial Group; Alfonso Nieto, Hola TN Newspaper; Adriana Nuñez, Mi Banco; James Threalkill, Skanska; Tera Vazquez, Guy Brown Products; and Peter Woolfolk, Communication Strategies. Vol State hosted its annual Hispanic Family Night for adults interested in English classes or returning to school, and teenagers just getting ready for college.